Post-graduate students of osteopathic medicine are required to engage in research-based work-integrated learning as educational preparation for clinical practice. This requires students to develop research projects related to clinical practice, and engage the principles and practice of the University’s Human Research Ethics Committee protocols. However, students who enrol in osteopathic courses may not appreciate or engage with research projects. The aim of this paper was to undertake an initial evaluation of pedagogical processes that attempt to bridge the gap between students’ research projects and clinical practice. Responses (n = 34) from an online student survey were analysed using descriptive statistics. Open ended-survey responses, transcriptions from two focus groups and written reflections from academics supervising student-led research projects were thematically analysed. Results suggested that research-based projects were a useful pedagogical tool for students’ learning about ethical clinical practice. We recommend 1) making the connection between ethical behaviour in research and in clinical practice explicit from the outset; 2) conducting clinically relevant projects; and 3) providing opportunities for students to reflect on their experiences as researchers. 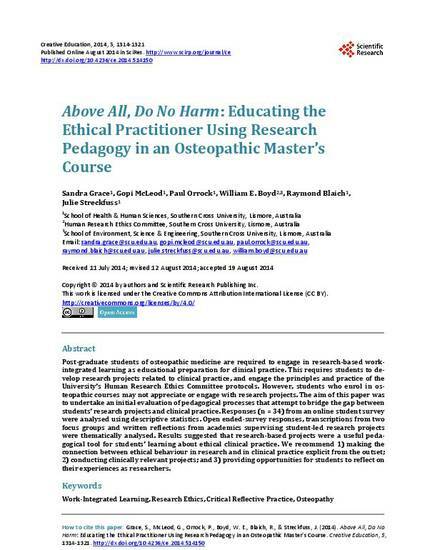 Grace, S, McLeod, G, Orrock, P, Boyd, WE, Blaich, R & Streckfuss, J 2014, 'Above all, do no harm: educating the ethical practitioner using research pedagogy in an osteopathic master’s course', Creative Education, vol. 5, pp. 1314-1321.